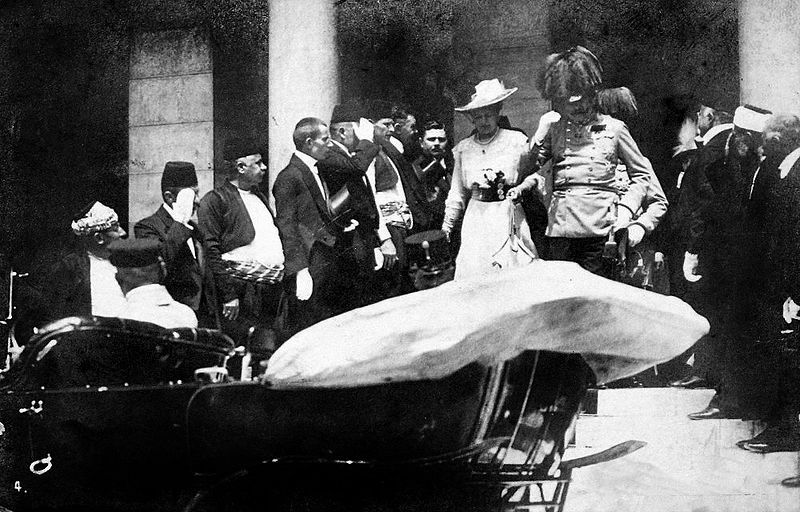 Last known photo of Archduke Franz Ferdinand prior to assassination, from Wikimedia Commons, attributed to Karl Tröstl. Last week in my news roundup, I mentioned the “trigger-event” for World War I offhandedly, and then moved on to other issues with a promise to return. It’s time now to talk about that fatal June 28, almost 100 years ago. To put it bluntly, that assassination did not “cause” the war. It was simply the excuse that made it possible to engage a war that had many, many more causes. I would guess that preventing the assassination would delay the war by weeks or months, maybe even until early 1915, but it would not prevent it. I want to be clear, also, that I’m not arguing that World War One was “inevitable.” Historians hate that word. There probably were ways to stop it, quite possibly even after the assassination of the Archduke, but it takes more to stop a war than just tweaking the details. I’ve been trying to make this clear in previous context posts by talking about just how unstable the diplomatic situation in Europe was at this time. I’ve hinted at the First and Second Balkan Wars, which had left highly unsatisfactory treaty arrangements which several factions opposed. There’s also the First and Second Moroccan Crises, as well as other colonial conflicts, which refused to stay isolated in the colonies. There’s sporadic outbursts of violence among the decrepit empires, such as the Pogroms in Russia or the Greek genocide in Turkey. And there’s just the fact that Europe was divided very strangely, between various powers like the Habsburgs that couldn’t possibly represent the interests of most of the people they ruled, and that nationalistic ideologies had been spreading among the various minority populations for nearly a century. Finally, there’s that old standby “German aggression,” which I think has been overplayed at times, but it’s true that the Schlieffen Plan, which essentially outlined Germany’s invasion of France, had been proposed as early as 1892, and that historian Fritz Fischer claimed that the German government had definitely decided on war as early as December 1912. What it all comes down to is that history is rarely if ever about the small-scale, easily understandable acts of individuals. Things like wars happen for more than one reason. If you find yourself thinking that you know for sure the one reason something happened in the past, quite possibly you’ve fallen for a conspiracy theory. I think that understanding this makes for a much richer study of history, one in which complex contingencies are accounted for, and constant subtle modifications are made to our reading of the historical record. That’s what makes it interesting to do something like experience film “as it happened” 100 years ago. I hope you continue to find it a worthwhile endeavor as well.